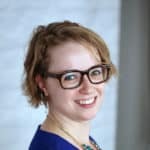 As the direct-to-consumer mattress business grows, it’s no surprise that companies are trying to stand out from the competition—not just by making better mattresses, but also by looking beyond them. Mattress companies, including Nest Bedding, are selling sheets, pillows, pajamas, and now, sleep masks. So is the Nest Bedding Luxury Sleep Mask enough to make the brand stand out from the pack? Keep reading to find out. The Nest Bedding Luxury Sleep Mask is simply packaged in a disposable plastic sleeve. It doesn’t come with a carrying case, earplugs, or anything else—it’s just meant to stand on its own. The Nest Bedding Luxury Sleep Mask has a simple elastic strap covered on one side with what I’m now going to refer to as the silk velour. There’s no Velcro or slider here, which can limit who’s able to use it, but it’s very stretchy and seemed to be pretty forgiving. Based on how the strap is stitched onto the mask, two things immediately jumped out at me: first, that the velour side faces away from your head, so it’s probably more decorative than it is a practical feature, and second, that the side of the mask that faces, well, your face, is also the side that the large Nest Bedding label is affixed. Printed on ribbon, the label seems easy enough to remove, but why not just stitch it on the outside to begin with? The non-adjustable head strap and Nest Bedding label are sewn onto what appears to be the back-side of the mask, but you can reverse the mask and turn this side facing out. 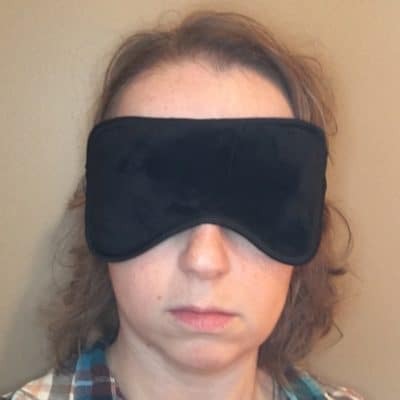 I’m not the biggest fan of blindfold-style sleep masks because I don’t enjoy having too much pressure on my eyelids. But although the Nest Bedding Luxury Sleep Mask did lay flat on my face, it didn’t put any undue pressure on my eyes. Sure, I couldn’t open them like I can in the masks that feature pockets or indentations over the eyes, but I also didn’t feel like my lids or lashes were being held down. The Nest Bedding label on the mask was a little annoying on my forehead, but after seeing that the mask is described as reversible on the Nest Bedding website, I simply turned it around to face outward. This did mean the straps had to double back on themselves slightly (tightening the mask by about half an inch overall) but it didn’t add enough bulk to the sides of the mask to be concerning—and as a bonus, it meant that I now had velour, and not elastic, facing my head. Seeing as the strap rests just above the ears and risks rubbing overnight, this was a welcome change. Nest Bedding promises its Luxury Sleep Mask is like having “a soft cloud resting on your face while choirs of angels sing your favorite lullabies.” With its soft materials and comfortable fit, this description is more apt than you’d think. 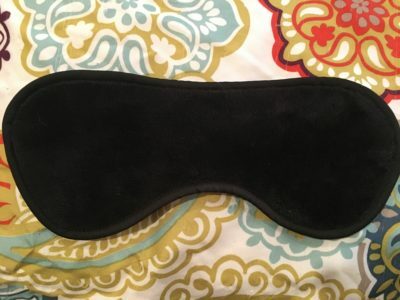 The Nest Bedding Luxury Sleep Mask does not claim to provide the wearer total darkness, but because it’s not meant to be a mask under which you can open your eyes I found the little light seeping in from bottom area of the mask to be a non-issue—and my bedroom is directly across the street from a very bright street lamp. Was there more light coming in than with a blackout-style mask? Certainly? Was it obtrusive? Not for me. Because the Nest Bedding Luxury Sleep Mask’s strap does not adjust, I was concerned that the mask would either feel too tight or that it wouldn’t stay in place overnight. Although people with larger or smaller heads than mine (or more or less hair than I have) might still find that to be an issue, I was pleasantly surprised to find that the mask it almost perfectly. I did have to do a little fidgeting when I got into bed to straighten the mask and keep the strap in place once I lay down on my side, but once the mask was in place I was able to sleep comfortably in my preferred position all night. Side sleepers don’t have it easy when it comes to sleep masks, and it’s no small thing that the Nest Bedding mask made my comfort possible. 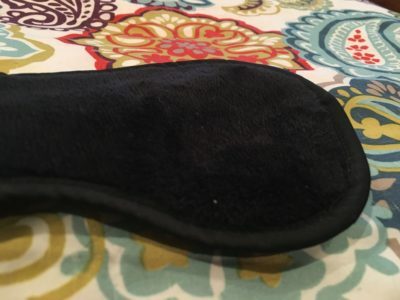 The Nest Bedding Luxury Sleep Mask is a typical, blindfold-style mask. What sets it apart is the materials used. Ever have one of those days where you get up, get dressed, and then find out that the thing you were supposed to do in the morning is no longer happening and you could have slept for another hour? That happened to me recently, and so I decided that I would, in fact, go back to bed for an hour—or at least, what was left of that extra hour by the time I checked my email. 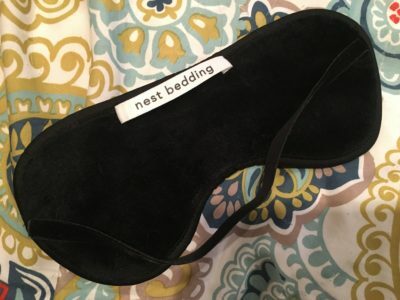 It seemed like as good a time as any to give the Nest Bedding Luxury Sleep Mask another try. Unfortunately, I had just finished my makeup. And as comfortable as the mask is, I found that in this particular case, it was far from ideal. I woke up refreshed from my nap, but my eyeliner had smudged enough that I had to do quite a bit of touching up. I wasn’t surprised by this—I’ve found it to be the case with all blindfold masks—but I was really hoping that the silk velour would have some sort of magical makeup-preserving qualities. While I found it easy to nap in the Nest Bedding Luxury Sleep Mask with sun streaming in through my windows, it’s important to note that I am not overly light sensitive. Someone who is may find, in a situation like mine, that the mask does not provide enough darkness for daytime sleeping. Even with my eyes closed, I could tell some light was leaking in. Though the Nest Bedding Luxury Sleep Mask is not adjustable, it still fits snugly. Nest Bedding hit the direct-to-consumer mattress scene in 2011 and now has ten storefronts in Los Angeles, San Francisco, Chicago, Phoenix, Denver, and New York City. While some competitors only offer one or two styles of mattress, Nest offers six, as well as pillows, bedding, and bed foundations—including a first-of-its-kind cardboard platform bed. Nest Bedding’s website also features a Lifestyle section, where the Next Bedding Luxury Sleep Mask can be found, in addition to sleepwear, dog beds, and more. 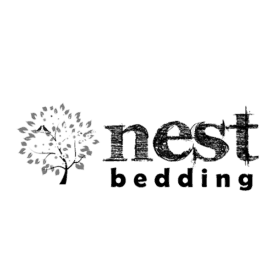 Return Policy: Nest Bedding’s FAQs do not mention a return policy for any products other than their mattresses. Contact [email protected] for questions about the Nest Bedding Luxury Sleep Mask or other “lifestyle” products. The Nest Bedding Luxury Sleep Mask is made of “soft, fuzzy materials” that feel very soft against the skin…and also collects pet fur. While I’m not 100% certain that the Nest Bedding Luxury Sleep Mask’s outer covering is actually silk, Nest Bedding promises that while wearing the mask you’ll feel like you have “a soft cloud resting on your face while choirs of angels sing your favorite lullabies,” and the description isn’t too far off. 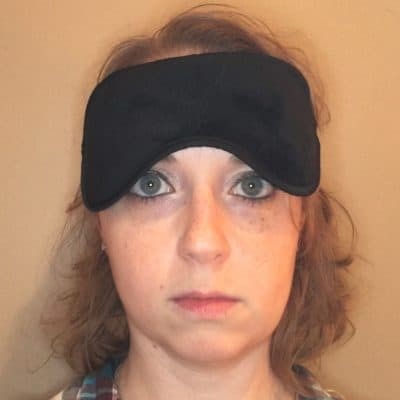 I didn’t find the Nest Bedding Luxury Sleep Mask to be the most practical choice for my daytime napping habits (which usually involve me napping until the last possible minute before I have to see someone or be somewhere, and not wanting to have to spend time touching up my makeup), and it is a little on the pricey side—but I couldn’t find any major faults with it when it was time to get a good night’s sleep.